Errors were seen on a wide range of web servers and wikis, including during JobQueue execution. T184670: [wmf.16-regression] Fatal exception of type "Flow\Exception\InvalidDataException" for opting out from "Structured Discussions on user talk"
Reproducible, I can't edit the header. Identical output in webconsole, except for line numbers. and got the same error. Could not find a revision to load flow content. and there is nothing to match it in the onwiki Board-history, or the onwiki recentchanges feed. I tried again, and the edit was saved successfully. But, I cannot do the same at enwiki. The referenced page headers are both editable now. As for the IRC feed, it looks like we have a bug where the IRC lines go out before the database transaction is commited. I've put up https://gerrit.wikimedia.org/r/155438 to deal with that issue. The other issue i noticed here was bad data in a related WikiReference from before we correctly handled relative titles from parsoid. It was a single reference so I updated it from eval.php and everything seems to be working again. Neither of address the original issue, but I can't seem to reproduce it after fixing the above issue. after fixing the above issue. ok, I can't reproduce currently either, so will reduce importance, and mark unconfirmed. 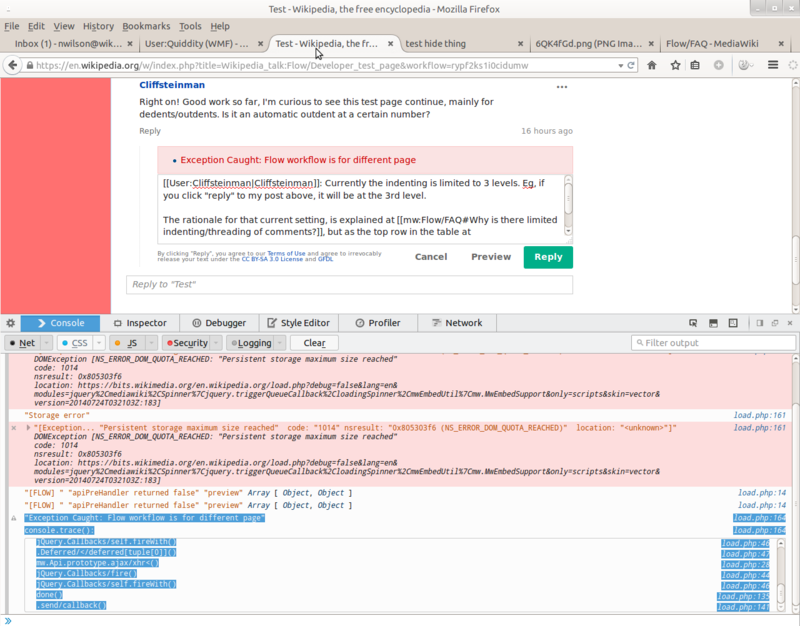 Krinkle added a project: Wikimedia-production-error. I've updated the task description with more recent data from Logstash. This caused 96 fatal errors in last 30 days. I've been causing a certain amount of them while troubleshooting T198771, which is one of many materialization of this problem. JTannerWMF edited projects, added Growth-Team (Current Sprint); removed Growth-Team. JTannerWMF assigned this task to kostajh. kostajh mentioned this in T181213: Error message displayed when converting a page from Structured discussions to unstructured wikitext, using the Beta feature. kostajh closed subtask T181213: Error message displayed when converting a page from Structured discussions to unstructured wikitext, using the Beta feature as Declined. The exception occurs in the context of a user ban. From reviewing the logs for both users (zhwiki, elwiki) we can see that the exception pops up after the ban is instated. My guess is that the order of operations is something like 1) user is banned, 2) user goes to their preferences to turn off their Flow enabled talk page, 3) a bug in Flow/core relating to the user being banned results in the mediawiki DB not getting updated properly, so that their talk page is still considered by core to be a Flow page when it shouldn't, and the Flow DB has been updated so that the workflow can't be loaded. While both manifestations are similar in that database synchronization plays a role, the first manifestation corrects itself without any intervention, whereas the second manifestation has resulted in two broken user talk pages. I'll start investigating the second manifestation and see if I have any ideas about how to fix the DB synchronization challenge as well. I did some more testing on testwiki - the first manifestation, as you mention in your above comment, is still quite easily reproducible when enabling/disabling 'Structured discussion...' beta feature. There is a small annoying bug - the state of the checkbox for 'Structured discussion...' beta feature is very often out of sync with which format the User talk page is displayed - the page might be in Flow format, but the checkbox is displayed unchecked. kostajh closed subtask T202358: Fatal exception of type "Flow\Exception\InvalidDataException" when disable structured discussions board on zhwiki as Resolved. Interesting, I hadn't noticed that but I'll keep an eye out for it! This is not exactly the same scenario as what occurred with the users on el and zh wiki, but at least it gives us an idea of how to reproduce it locally which should lead to some clarity on how to fix the problem in various scenarios. I think T201654: InvalidArgumentException "The Title object yields no ID" from Flow\LinksTableUpdater (via LinksUpdate::construct) might be related. Some more notes on this. There are two issues co-occurring here. The first issue is that disabling a Flow board as a blocked user erroneously results in an ImportException getting thrown due to insufficient permissions: handleSubmit() returns an array of errors, and then OptInController.php#L550 throws the exception. This shouldn't happen because the context passed to handleSubmit is supposed to be the "Flow talk page manager" user, not the user who is enabling/disable preferences. Looking at the Mediawiki docs on use of transaction rollback, it seems like we should not be calling ->rollback() at all but instead throwing an exception, which should handle rolling back all databases. When I do so locally (throw new \MWException('some message', 0, $t) in the context of the try/catch block in OptInController#L136, that seems to work. As noted in my comment above, I've been able to reproduce a variation on this error, so one idea would be to try changing the rollback code in the try/catch block for testwiki only, and see if that works. 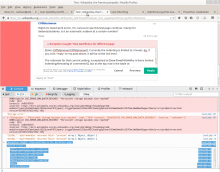 Marking T184670: [wmf.16-regression] Fatal exception of type "Flow\Exception\InvalidDataException" for opting out from "Structured Discussions on user talk" as related. There's a separate but related issue about the logs not populating when gathering errors for blocks, will continue looking into that. Locally, I've verified that adding the protectedpagetext and editprotected rights to the Flow talk page manager (I tested by adding this user to the sysop group) would allow users to disable Flow on their talk page even if it's marked protected. However, it seems like that isn't exactly desired behavior – presumably if an admin has marked someone's talk page as protected, they don't want that user to be able to change it at all. What I'd like to do next is inspect $errors = $workflow->getPermissionErrors( 'edit', $context->getUser(), 'secure' ); via mwrepl on zhwiki or elwiki for the problem pages that we know about. Will come back to this on Friday or next week. Once 6394b76d67d57b9708ae7ede1d388152f67c284b is in production, we'll have better insight into the exception that's thrown as well as some more information in the logs. We can also see if rolling back the DBs then works as intended. Also, here's a debug script to print out the errors (we need to fill in the user ID for users we want to look at): P7615. But let's wait until after the train is in production so that exceptions will be caught properly. We can handle these errors on a case by case basis. We have some additional logging in place now, and are properly catching exceptions in the OptInController, so we will come back to this if/when fresh instances of the problem are reported. kostajh edited projects, added Growth-Team; removed Growth-Team (Current Sprint). Still seen in recent logs. The latest repro case is https://www.wikidata.org/w/index.php?title=User_talk:Seojeongah80&action=history. [W@JlZApAICwAAFTvFcQAAAAX] 2018-11-07 04:09:08: Fatal exception of type "Flow\Exception\InvalidDataException"
@Krinkle I triggered that one while looking at T201654. I could be wrong but I think that this user's talk page was broken before the various fixes we implemented around this bug were deployed. The user is blocked, so they probably tried to convert their talk page to Flow, an exception was thrown and not caught (since HHVM didn't recognize the catch Error $error syntax. I can run the script to manually fix this user's page but I don't think it's something that will come up in the future when enabling/disabling flow. I am leaning towards abandoning https://gerrit.wikimedia.org/r/c/mediawiki/extensions/Flow/+/455897, 1) rollback on exception is working properly now and 2) in the patch, there's no UI to show to the user that we didn't actually enable Flow when the permissions check failed. Checked a total of 1200 Flow boards. Of those, 1 boards had an inconsistent title; 1 were fixed. From https://www.mediawiki.org/wiki/Topic:050e2fb772abdae40bd7842b2b77d26b, which still reproduces the error when viewed, at time of writing. I looked at this and other examples, it looks like it's all older content. I ran mwscript extensions/Flow/maintenance/FlowFixInconsistentBoards.php --wiki=mediawikiwiki --dry-run but it didn't pick up anything to be fixed. I think the options here are either 1) a maintenance script to clean up this older, inconsistent content or 2) an alternative to throwing InvalidDataException in WorkflowLoaderFactory.php#loadWorkflowById, perhaps redirecting the user somewhere. kostajh added a subscriber: kostajh. Unassigning myself although I would like to resolve this one someday. zeljkofilipin moved this task from Backlog 🔙 to Train 🚂 on the User-zeljkofilipin board.